JOHOR BAHRU, 2 July 2018 – Universiti Teknologi Malaysia (UTM) has embarked on a unique history when undertaking the restructuring of its academic entity and witnessing the merger of faculty from 18 to seven. The restructuring is effective from 1 July 2018 as decided by the UTM Board of Directors’ meeting which convened on 16 May 2018. UTM Vice-Chancellor, Prof. Datuk Ir. Dr. Wahid Omar said the restructuring, known as UTM Synergy 4.0 leads the university to have only seven faculties. “This major transformation is meant to open up more opportunities for synergy and collaborations between academicians from different academic disciplines and new innovation in offering academic programs that are able to fulfill the new needs of the society in the future. “We do not expect a smooth sailing in our new journey, but it is our commitment to iron out any form of challenges and hurdles together,” he said. Prof. Wahid said that by this transformation, it is hoped that UTM will continue to be relevant as one of the best universities of choice by the local and international students. 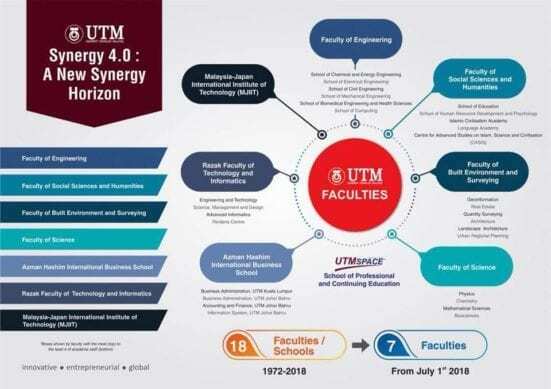 The UTM Synergy 4.0 has merged several faculties into seven faculties namely the Faculty of Engineering, Faculty of Social Science and Humanities, Faculty of Science, Faculty of Built Environment and Surveying, Razak Faculty of Technology and Informatics, Azman Hashim International Business School and Malaysia Japan International Institute of Technology (MJIIT). “Meanwhile the Faculty of Social Science and Humanities was formed from the merging entities of the Faculty of Education (FP), Faculty of Islamic Civilization (FTI), Department of Human Resources Development of Faculty of Management (FM), Language Academy, and Center for Advanced Studies on Islam, Science and Civilization (CASIS), “said Prof. Wahid. The new entity of Faculty of Science is a result of the merging between the old Faculty of Science and Faculty of Bioscience and Medical Engineering (FBME), and Faculty of Built Environment (FAB) merged with Faculty of Geoinformation and Real Estate (FGHT) to form the newly established Faculty of Built Environment and Surveying. “The restructuring process also involve several schools in UTM Kuala Lumpur such as UTM Razak School, UTM Advanced Informatics School (UTM AIS) and UTM Perdana School. These three schools have merged and formed one entity known as the Razak Faculty of Technology and Informatics. 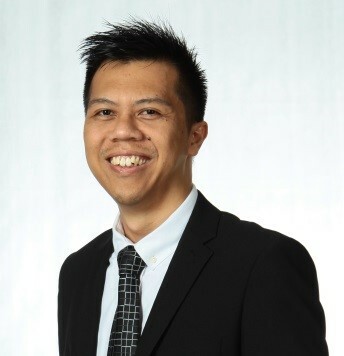 “Meanwhile, the Azman Hashim International Business School (AHIBS), Faculty of Management (FM) and Department of Information System, Faculty of Computing (FC) are now merged to form a new faculty that is known as the Azman Hashim International Business School,” he said. In addition, the Malaysia-Japan International Institute of Technology (MJIIT) remains as it is, without any reshuffling.